Read entity properties and set its in object. Create enumerator for entity's patches. Compute per-vertex colors using simple interpolation. All entities in input file can have explicit name. And this method set it. Create a instantiate of special entity class. Read color value from attribute of XMLNode and create its object representation. Read three colors from XMLnode from specified attributs and ctore its valeus. 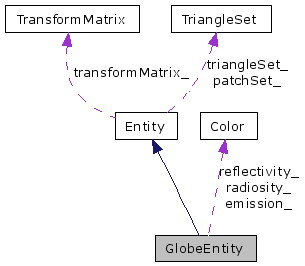 Add triangle to entity using tranformation matrix. This entity has sphere as base shape. Radius of this sphere is 0.5 and center is in Vertex(0.0, 0.0, 0.0). See documentation of Entity class for more information about transformations, patch division, etc. Definition at line 19 of file GlobeEntity.h. from XMLNode containing entity declaration. Calling this method after deserialize has no effect. matrix Transformation matrix to set. There is no need to keep it in memory after call of this method. size Size of the largest acceptable patch. Return instance of PatchSequenceEnumerator allocated on the heap. Return instance of TriangleSetExt allocated on the heap. XMLNode wich is representation of entity. const char * implicit = "entity"
from XMLNode wich contains entity declaration. Definition at line 99 of file Entity.h. Definition at line 105 of file Entity.h.